Measuring only 1.55 x 1.08 x 0.47", and weighing just 2 ounces, the Model QH8362 is one of our smallest, High Power, 90° Hybrid Couplers to date. The QH8362 covers the full 800-4200 MHz frequency band, and has an average power rating of 150 W CW. A Drop-In design is also available, Model QH8105. Measuring only 1.55 x 1.08 x 0.47″, and weighing just 2 ounces, the Model QH8362 is one of our smallest, High Power, 90° Hybrid Couplers to date. 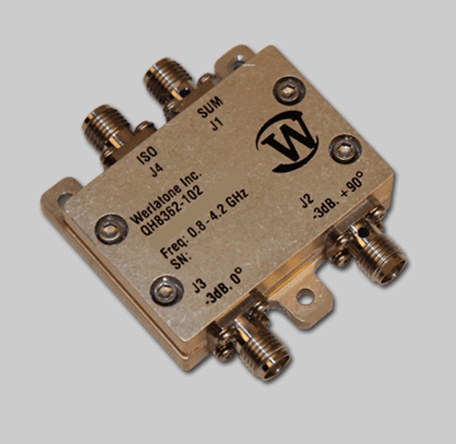 The QH8362 covers the full 800-4200 MHz frequency band, and has an average power rating of 150 W CW. A Drop-In design is also available, Model QH8105.